The Eastern Wyoming College Foundation, and Premier Sponsor Platte Valley Bank presents nationally recognized singing cowboys The Bar J Wranglers. This performance will take place on October 11, 2013 at 7:00 p.m. in the EWC Fine Arts Auditorium in Torrington, Wyoming. Tickets are on sale now. A limited number of premium seating tickets are on sale for $50 at the college in the Office of Development. General admission tickets are also on sale for $20. Tickets may be purchased at Platte Valley Bank, Pinnacle Bank or the Office of Development. Participants in this course will learn to use Publisher tools, templates, and ribbon features to create a variety of documents for print or online use. It’s perfect for beginners who want to learn how to design professional-quality newsletters, fliers, brochures, and letterheads. The Eastern Wyoming College golf team continued the regular season with another first place regional finish at the Otero/Lamar, CO tournament. The Lancers had a team score of 604. “EWC placed 5 golfers in the top 8 and Brandon Rideout was edged out for the tournament title as it came down to the last hole” said Coach Casey Jones. 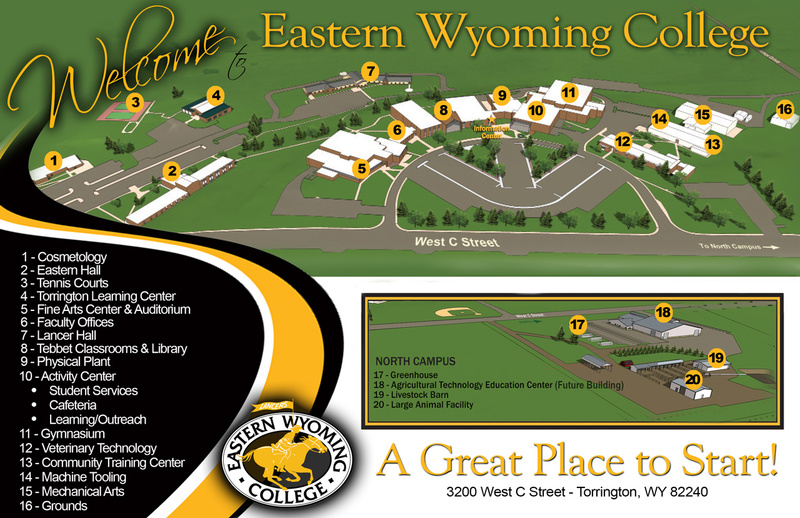 EWC will travel to Trinidad State Junior College for the final fall golf tournament on September 26-27. To register for this class or any others, contact the EWC Community Education office at 307.532.8213 or 307.532.8323 or stop by to visit them at 3200 West C Street in Torrington. Sadie Gjermundson, kicked off the rodeo season with a big win at the Central Wyoming College rodeo held this past weekend. The sophomore from Halliday, ND won the breakaway roping with a total time of 6.9 seconds on two head. She also qualified for the short go in the goat tying. Teammates Becca Kartak, sophomore, Colome, SD and Jordan Hagedorn, freshman, from West Point, NE finished in second and fifth places respectively in the breakaway roping as well. In the barrel racing, Bailey Schaack, freshman, Hyannis, NE finished the weekend in second place. Sophomore Alicia Eaves, Lancaster, CA was sixth. EWC sophomore team ropers Derek Weinreis, Beach, ND and Levi O’Keeffe, Mohall, ND started out their year with a second place finish and look forward to another great season. Also placing in the team roping were the teams of AJ Freeman, freshman, Dunning, NE and Dustin Dailey, sophomore, Long Pine, NE, fifth place; Wyatt Mann, freshman, Box Elder, SD and Trae Kautzman, sophomore, Kindred, ND, 8th in the long go, Tyler Gaer, freshman, Newell, SD and Carson Musick, freshman, Pierre, SD, 9th in the long go and Becca Kartak and Lane Hall, sophomore, Winner, SD, 10th in the long go. In the saddle bronc riding, EWC’s Josh Davison, sophomore, Miles, City, MT finished 9th in the long go. The EWC Men’s and Women’s teams both finished the weekend in 5th place. The Lancer Rodeo team will travel to the Chadron State College rodeo September 20-22. The Massenkoff Russian Folk Festival kicks off the season on Sunday September 22 at 2 pm in the EWC Auditorium. Tickets in advance are $15 for adults, $5 for children 12 and under. Ticket prices at the door are $20 adults and $10 for children. Nikolai Massenkoff, international acclaimed star of The Massenkoff Russian Folk Festival, founded the Massenkoff Russian Folk Festival, a festival of Russian music song and dance because of love for his Russian heritage. He has performed more than two decades both nationally and internationally to great acclaim. These performances included: Carnegie Hall; Olympic Stadium in Seoul, Korea before a live audience of 90,000 people; over 100 performances at the International Division of Epcot Center’s World Stage in Florida; with major symphony orchestras — San Francisco, Baltimore, Edmonton, Honolulu, Palm Beach, Flagstaff, London, Edmonton and in 2005 will appear with the Cincinnati Symphony; major performing arts centers; national and international television, including Sudwestfunk (Baden, Baden, Germany) and the MGM Grand Hotel in Las Vegas. Mick Maloney, Irish musician and folklorist combines the careers of folklorist, musicologist, arts presenter and advocate, professional musician, and professor of music and Irish studies. In 1999 he was awarded the National Heritage Award from the National Endowment for the Arts — the highest official honor a traditional artist can receive in the United States. This concert will be December 4 at 7 pm in the Eastern Wyoming College Fine Arts Auditorium. Also featured with this event is local visual artist Julie Nighswonger. The South Dakota State University Faculty Jazz Quartet will perform on Saturday April 12 at 7:00 pm in the Fine arts Auditorium at EWC. The South Dakota State University (SDSU) Faculty Jazz Quintet is made up of current faculty, former faculty, and local professional musicians. The quintet regularly performs for university functions and various local and regional professional engagements. Dr. Nathan Jorgensen (saxophones) is Assistant Professor of Woodwinds and Jazz at South Dakota State University, a position he has held since 2008. He directs both of the university jazz ensembles. Robert McCurdy joined the SDSU music faculty in 2012 as a part-time instructor of Jazz Improvisation, Jazz Combos, and Jazz Appreciation. In 2005 Robert moved to Kansas and was featured in performances with the Boulevard Big Band, Capital City Jazz Band, Topeka Jazz Workshop, Kansas City Jazz Orchestra, 9 plus 1, and others. James McKinney joined the SDSU faculty in 1973, as Assistant Director of Bands and Percussion instructor. He served in that capacity through 1975, when he accepted a similar position at Iowa State University. He returned to SDSU in 1983 as Associate Director of Bands and Director of the “Pride of the Dakotas” Marching Band. He became Director of Bands in 1985, and served in that position until his retirement in May, 2009. Jeremy Hegg, Music Director for the Hegg Brothers, is the oldest son of two lifelong music educators, grew up in Dell Rapids, South Dakota, and received his music degree from Augustana College in Sioux Falls. He is the staff arranger and composer for the Augustana Brass Choir, Sioux Falls Municipal Band, and many marching band programs nationwide. Andrew Reinartz is an area musician, educator, and conductor, and has been a member of the South Dakota Symphony Orchestra bass section since 2001. He is a member of the Jazz Diversity Project which, through the auspices of the Sioux Falls Jazz and Blues Society, gives performances and presentations on the musical, social, and historical aspects of the music in schools throughout South Dakota. Missoula Children’s Theatre once again will grace the stage of EWC on Friday May 16 at 7:00pm and Saturday May 17 at 2:00pm. Children from around Goshen County will enjoy their week with the Missoula Children’s Theatre developing critical life skills such as teamwork, communication, social skills and self-discipline as they prepare to perform “Blackbeard the Pirate. The program increases access to the arts for children between ages 5-18 in rural communities and the performances reinforce the values and goals of local schools by teaching children that hard work, discipline, and listening skills lead to success. Claude Bourbon, French guitarist will perform Sunday June 1, 2014 at 2 pm in the EWC auditorium. Featured local visual artist will be Marvie Tipsword. Season tickets are on sale now for $50. The best value is to purchase a season ticket and save $35 on the season of five performances. Tickets are available at the Community Education office at EWC, Pinnacle Bank and the Goshen County Chamber of Commerce. To purchase tickets or for more information, contact the EWC Community Education office at 307.532.8213 or 307.532.8323 or stop by to visit them at 3200 West C Street in Torrington. The Eastern Wyoming College golf team started the regular season with two first place regional finishes. The Lancers had a team score of 607 at the Northeastern Junior College tournament and a 626 at the McCook Community College tournament..
“It was nice to get started for the 13-14 season with a decent start. We have four freshmen who are very capable players and I know their scores will continue to improve as they get used to college golf. Our sophomores, Garrett Mortimer and Brandon Rideout, did a great job of setting the tone and put us on their back to pull our team through these first tournaments.” shared Coach Casey Jones. “Garrett Mortimer played very solid on a very challenging course in McCook to bring home the individual championship as well” said Coach Jones. EWC will host their tournament in Torrington September 12-13.